Colour photocopying is available using your printing account at the terminals on the photocopying devices. Prints and copies can be done up to 11 x 17". The Faculty has a series of scanners in the studios and the library. 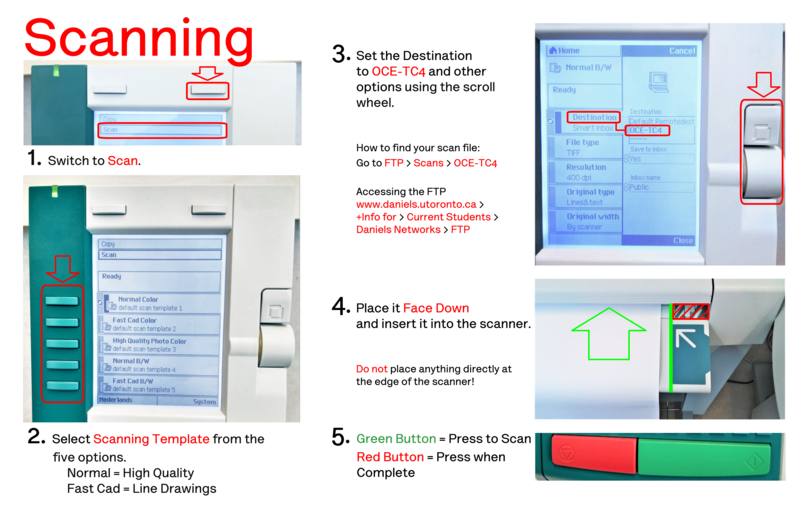 The scanners can scan up to 11 x 17 inches in full colour. NOTE: The Scan to network directory is NOT a private directory; other members of the folder have access to these files. Systems Administrator's may from time to time delete files older than one day. Do not leave files in this directory - MOVE or "cut and paste" the files to your own directory. For anything larger than 11 x 17 inches (A3 size) paper, our faculty has a large-format scanner located in the plotter room (rm 177) that is capable of scanning up to A0 size paper or 36 inches.